Wear the Yorke garment dyed striped T-shirt this season and enjoy a super-soft, reassuringly thick 100% cotton t-shirt that’s packed full of quirky little design details reflecting the classic Weird Fish attitude. 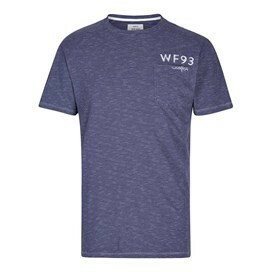 In Maritime Blue and made from yarn-dyed striped cotton our stylish t-shirt includes a comfy cotton elastane rib collar and pocket detail as well as a 'WF93' print above the pocket. The Yorke garment dyed striped T-shirt is a great choice for when you need to look smart but want feel relaxed and comfortable too, perfect for that family get together in the sun. T-shirt, slippers and Macaroni Sweatshirt - excellent! Great design and quality! I will wear them with pleasure, thank you. Good quality and texture. looked really nice on. Very happy with this T-shirt, which looks good & feels good.